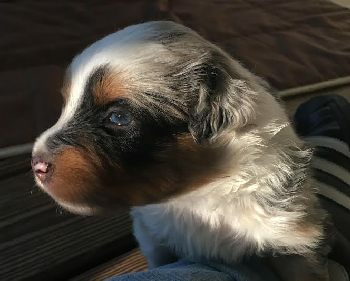 You know what an Australian Shepherd looks like? They are very striking and cool looking. As a result, "Aussies" are HOT right now. For that reason, I decided to tell you our little story. 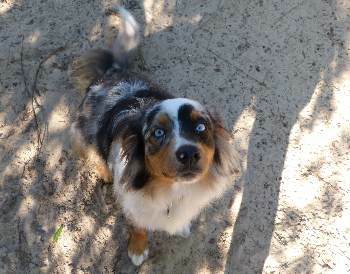 If we can save one Australian Shepherd dog (and his owner) from a life of misery, then it is worth taking the time and webspace to do so. Although Mini was the runt of the litter, she early-on showed signs of great intelligence, independence and fearlessness. By the age of four months, her personality was maturing along with her body. And boy did we have a learning curve to deal with. Aussies are hyperactive (I like to say just a notch below a Jack Russell Terrier). They require tons of attention and massive amounts of play and exercise each day. 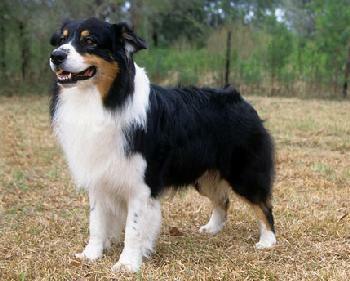 Australian Shepherd dogs actually originated in the Western US, and were bred and developed to herd sheep. 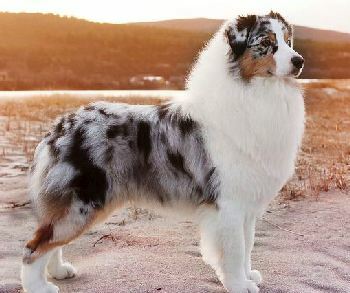 They did not come from Australia, and it is not known why they are called Australian Shepherds. Aussies have an inbred herding instinct, and will actually try to herd anything if they don't have sheep: children, our cats, even friend's cars as they come and go to our property. The point we want to make is, these beautiful animals are outdoor work dogs, and should not be confined indoors for very long. If you want a calm little lapdog, try a toy poodle or shih tzu. If you are considering getting an Aussie, please heed our warning. Do not get an Australian Shepherd dog unless you have plenty of space for her to run and play and lots of free time to give her attention and exercise… Every day! Don't even consider it if you work full-time or don't have a large fenced yard. A quick walk around the neighborhood on a leash after work will just not get it. Keeping an Aussie confined, either by tying out, crating or locking up in an apartment, is outright cruelty. 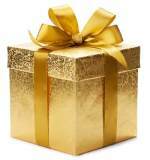 If they are ignored or neglected or confined for long periods of time, they'll turn nasty, spiteful and destructive. Mini is a tireless chewer and although we keep her entertained most of the day, she wants more! If you ignore your Aussie, she will eat your house! 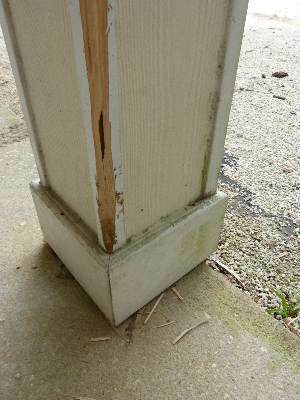 Even though Mini has lots of exercise and attention, she started working on the columns of our front porch at night. We figured she wakes up and just gets bored! I must also tell you this, even though Mini can be difficult, I have never met a more loving, big-hearted dog in my life. She absolutely adores us. She is loyal and bravely protective, letting us know when strangers come near. Mini is now two years old and we are just delighted to have her. She has truly been one of the best gifts I've ever received. As far as pet toys for our Aussie... She loves to chase the ball and Frisbee, but is very hard on them; chews to pieces anything she can. A tennis ball rarely lasts more than half an hour. To see which toys we found she loves but can't destroy, click here.